Searching for a new makeup look for summer? We've got the newest colors from gloMinerals and we are so excited to use them! The colors are beautiful and vibrant, but don’t be intimidated. We’ll show you how to wear these new colors, including teal eye liner and bright pink lipstick. You’ll be a femme fatale in no time – so flaunt your look! Before applying any makeup look, you should start with clean, dry skin. Then follow your beauty regimen with your moisturizer (with SPF during the day), and face primer. For this tutorial, we’ll give you tips for your eyes and lips, so have your gloLid Primer and Lip Revival ready for priming and to keep this look flawless! Starting with Precise Micro Eyeliner in Teal, draw a medium thick line on your top lash line. It’s okay if it’s uneven or messy. 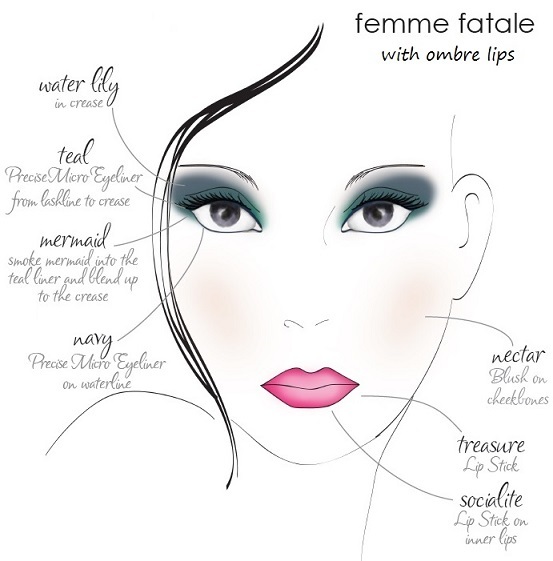 Using your Smudge Brush, “smoke” gloEye Shadow in Mermaid into the teal liner and blend up to the crease. Sweep gloEye Shadow in Water Lily over eyelid and into crease. Line the lower lash water line with Precise Micro Eyeliner in Navy. Curl your upper lashes with your gloLash Curler and apply two to three coats of the new Lash Boosting Mascara. Expert tip: before applying the second coat, you want your lashes to be somewhat “tacky,” not too dry or wet. This will give you the best results. For a fresh, flushed look: Apply gloBlush in Nectar to your cheekbones. Expert tip: Applying blush to the apples of cheeks, below the bone will help create a more youthful look. On to lips! If you’ve been searching for the perfect pink lipstick – we've got it! For this look, we're using gloLip Stick in Socialite and Treasure. Before applying lipstick, make sure your lips are soft and hydrated. If your lips are dry, chapped, or flaky – lipstick will settle into lines and will look messy. Use a lip treatment, (like Lip Revival) if needed. Just as you prime your face and your eyes, let’s prime your lips. The gloLip Filler Pencil is a clear liner pencil that can go under any lip color to smooth lip lines and prevent feathering. For our bright pink lipstick – it’s a must! You’ve probably heard of Ombre, whether in fashion, hair or nail trends. For summer fun, let's try this with lipstick. With a lighter shade of lipstick on the inner part of lips and a darker shade on the outside, your lips will appear fuller and plumper! After your lips are prepped, you’re ready to apply your first color – Socialite. Socialite is a fun, bubblegum pink that can look sheer or bold depending on application. Using a lip brush, apply Socialite to the inside area of lips (see picture for reference). Next, use your lip brush to apply Treasure to the outside portion of lips. Utilizing a brush for application will give you better control. We love this look! Do you? Leave us a comment below to let us know what you think and if there are other makeup tutorials you would like for us to feature. Valuable post about summer makeup and this picture really helpful and looks fantastic,thanks for sharing with us nice post. Get Ready for Sandal Season! MaMa Mio = The BEST Mommy Products! Check out these EGGSellent Products!